This has been an incredible month. After worrying daily about my friend, Patti, who has been continually in and out of surgery following her automobile accident in California, and anxious for our church secretary's new little baby who acquired a tear in his lung after his birth and was flown to Children's Hospital in Seattle, I felt like each day was spent continually on the computer scanning for updates on both their conditions. Both were touch and go - up and down - better and worse - unsure of outcomes. My heart went out to their families. At least I could visit in Seattle which was more than I could do in California. I didn't know if Patti would make it or if our new little church baby had a permanent condition. Whew! I was delighted for the end of the month to come. The Sunday before I left for Ashland, baby Wesley and parents were in church. He went home from the hospital without breathing tubes and thriving. Patti had been in for her 5th operation in less than two weeks and they finally seemed to have found and repaired the internal injuries after removing much of both intestines. She was still in ICU, but her condition was at least stable. She may still lose one of her feet, but they are hoping not. As I write this, it appears that she is finally out of imminent danger. What a roller coaster for her wonderful family who have been at her bedside vigil. I have appreciated their wonderful communication each step of the way. We needed information, they needed prayers -- we have been mutually intertwined. 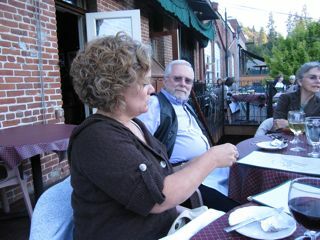 So, Dani, Jeni and I took off for Ashland to meet our friends, the Olmsteads, for five days. Bob and Carol and I had four baby girls when we lived in Berkeley and Oakland where Bob and Don attended Pacific School of Religion. 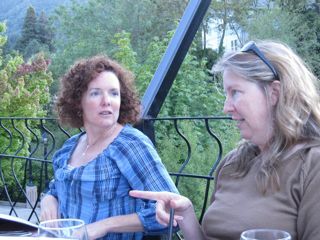 Dani and Amy were born a few months apart - same hospital, same doctor and two years later Laurie and Jeni followed suit. The girls spent lots of time together as babies. After graduation, the Olmsteads moved to Northern California while we went to Southern California - but we vacationed together and saw each other yearly. Amy and Laurie stayed with us in Santa Barbara while Bob and Carol finalized their adoption of Tony in Los Angeles. Later, they adopted Demian about the time we had Martin. Although we never lost touch, we certainly saw less of them as our children grew into teens - and it was a lovely reunion for the four girls this past week. We had so much fun together. Jeni said, "It seemed like no time had passed and we were all eleven again." 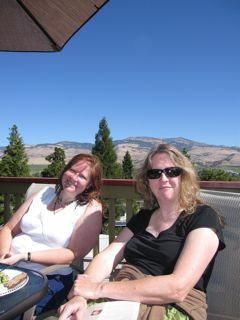 Amy lives in Reno and is a CPA and Laurie a social worker near Sacramento. I have seen them the past four years in Ashland, but this is the first time my girls could go with me. We saw wonderful theatre - in fact we saw exquisite theatre. Hamlet was unbelievable (and he had gone to Whitman College with Jeni). Pride and Prejudice was sweet and enjoyable. A play entitled Ruined about an African women who had been viciously raped was excellent if hard to watch. The other two I saw were Twelfth Night and American Night. We talked the girls into seeing Throne of Blood and She Loves Me - two plays that Bob, Carol, and I had loved when we went in August. We stayed in a Victorian flat three blocks from the theatre and spent lots of time visiting and eating! All in all, it was such a lovely vacation. It seemed like a wonderful gift to have such a lovely conclusion to a month filled with anxiety and concern about good friends. I spend at least once a day on Facebook. Sometimes I spend twice a day - once in the morning and once in the evening. I think some would think that was a waste of time. But, this morning, it was a gift because I found out that my good friends, Patti and Ralph Rea, had been in a devastating automobile accident yesterday on their way home from the Los Angeles area to Mammoth where they live. Ralph was basically uninjured but Patti suffered some internal injury and both ankles were broken. The car was totally demolished. I found out because Kathe posted it on Facebook. Interestingly, I had just had an email from my friend Peggy in Woodland Hills telling me that she had lunch yesterday with Patti and Ralph. She clearly did not have the information about their accident which I sent to her. She sent it around the church minutes later. But, even email could not match Facebook in timeliness. I was able to call Kathe and talk to her husband, Dave, and get flowers off immediately. After seeing pictures of the mangled car, I am very grateful that they are both alive. 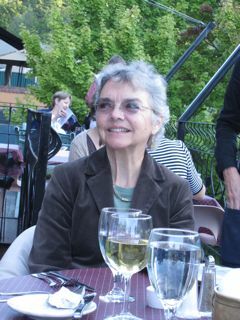 I have been following Leslie Guelker-Cone's trek with Katy across the United States, Seen pictures of Bette Keller's granddaughter, read about Margie Scribner's new teaching job for Job Corps, seen pictures of my new grandson from his visit to his Idaho grandparents, peeked at what my other grandchildren are saying about school this week, played Scrabble with Dee Robinson in one game and Keith and Janet Craswell in another, and checked in with Martin's childhood friend, Monica, and saw pictures of her two boys starting school this week. These are all little snapshots of life among friends and family -- but moments in time that I probably wouldn't have shared. In fact, I wouldn't have been in close touch with many of the people I follow on Facebook. I might have gotten snippets of information about my friend's children or grandchildren over time if they had thought about it while we were together. What a joy to know what Hope is doing in England or Dave and Nancy are doing as they teach in Cairo for two years. I think Facebook is a unique phenomenon that was far beyond my imagination just a few years ago. I don't have to post much myself or even spend more than a few minutes when I'm on the site but the enjoyment level is greater than the output of energy. Maybe I'm just nosy, but I really am interested in what people I care about are doing. I love the connections and the sharing. Where else could Kathe ask for prayers from so many people who care about her parents all at one time? I guess that I need to be at least nominally connected in this new electronic world. I did have my baby day and saw little Wesley in the hospital where he is finally in his own room and out of the surgery unit. He is doing well and should be good as new and going home very soon. His parents are real troupers considering it was a huge ordeal for your brand new first baby to have to be flown by helicopter to Seattle all trussed up in a little container and hooked up to machines. Wesley was born three weeks early and developed a tear in his lungs as well as jaundice - he is looking good at this time. After my meeting I got to hold my three week old grandson, Lionel, and then his parents and I went up to the top of Queen Anne to the Thursday market for dinner from all the good stalls. Martin and I had pulled pork sandwich while Christine had a piece of pizza - then down to observe a diaper change and a trip home. But, the best news is that Lionel has been here all weekend and we've had such a lovely time feeding and holding and cooing over him. He is like a little doll and mostly sleeps and eats, but he did decide that he liked his grandma singing to him last night and he watched me with quizzical interest and a bit of "now who is this person?" The dearest part of the evening was when little Nico decided to get a baby book and turned the pages and read it to Lionel while I was holding him. Nico was on his third book when we had to say that probably it was enough for one evening. He was so anxious to be a good cousin. Here are some pictures from the day. It was a busy one with Dave and Molly's family and the Craswells dropping by. Between the cookies I made in the morning and the never-ending teapot, the visits were most enjoyable and Lionel got passed around in good order. We ended the evening with a walk on Forest Street. Dani had Kinsey, Nico was on his scooter, James on his skateboard, and Lionel in his little fancy stroller (at least for most of the walk until he decided he didn't want to do that anymore and got carried by his daddy). It was a big day for Lionel (and probably his parents too). But, a very nice one indeed. I'm having a baby day today! I'm heading for Seattle to a City University luncheon meeting which gives me two lovely spans of time before and after the meeting. Before the meeting, I'm heading to Children's Hospital to see our church secretary and her new baby boy who was sent to Children's for a procedure soon after his birth last week. I'm loaded with prayer shawls, good wishes and a gift from our circle. I do hope I can actually see the babe, but especially to see Kathryn who has been keeping vigil with her husband. I think the baby got out of the nursery last night in preparation for a trip home. Of course, after my meeting I need a grandson fix and so will travel to see Lionel. I haven't seen him for over a week and I'm sure he will have changed. You can't let a new baby go for long without seeing the changes. Martin keeps me updated with little videos on my iPhone. He is sooooo cute. I can hardly wait. I have a habit lately of going to bed too late (like 11:30) and figured I'd get up at 7:00 and get ready to depart by 8:00. Unfortunately, I don't factor in Kinsey who decides every once in awhile that he needs to go walkabout at 6:00. I wasn't ready to get up yet this morning, but the deed is done, so I'm taking a moment on my blog. Kinsey is happily back home enjoying the morning. Our evening walk where he does his major duty was a bit too early last night. The sun is out so it should be a beautiful baby day. I'll post pictures of my trip tomorrow.